If you are developer who are looking for a free tool to understand and optimize your application’s memory usage then you can try out VMMap. 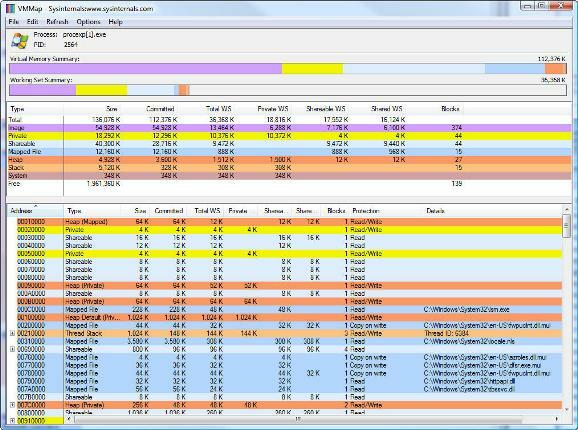 VMMap is a freeware tool from Microsoft which can be used to analyze the usage of virtual and physical memory by your application. VMMap is very useful for people who are trying to develop new applications. With the help of VMMap you can take a look at the breakdown of a process’s committed virtual memory types as well as the amount of physical memory assigned by the operating system to those types. VMMap will also show you a graphical representation of memory usage. It even shows you the summary information and a detailed process memory map. This will definitely help you to analyze the memory intense processes in your application. Moreover powerful filtering and refresh capabilities of VMMap will allow you to identify the sources of process memory usage and the memory cost of the application features. The best thing is that VMMap supports the export of data in to multiple forms, including a native format which preserves all the information so that you can load back the data for future analysis. VMMap also includes command-line options that enables you to write simple scripts for better analysis of data.